the default rotation is 00, meaning that the ultrasound beam spreads in the direction from the oesophagus to the sternum. Moving the slider right you turn the probe clockwise and moving it left turns the TEE probe counterclockwise. 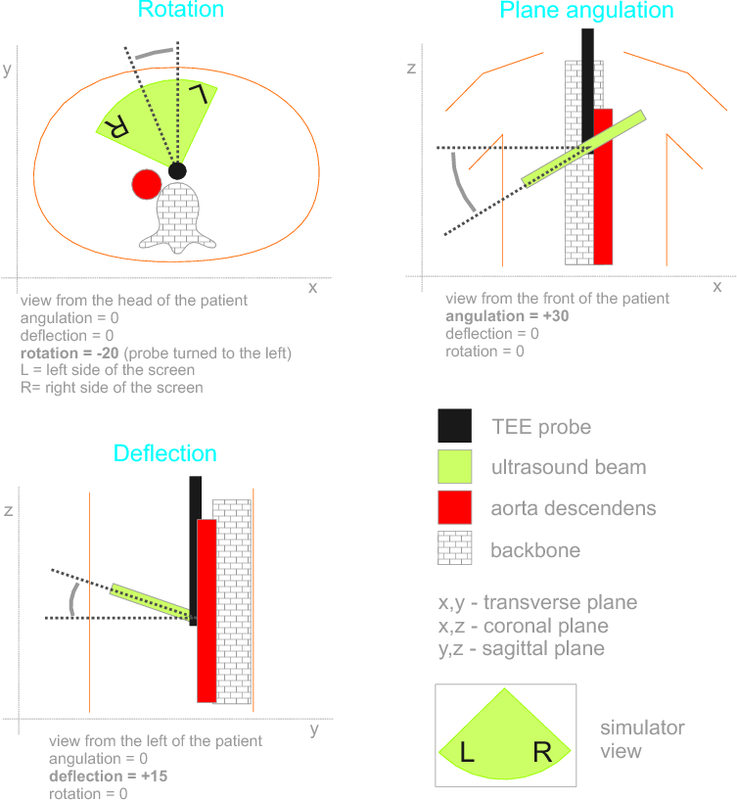 the default angulation is 00, meaning that (by rotation=00 and deflection=00) when looking from the sternum on the TEE probe the ultrasound beam plane is perpendicular to the TEE probe long axis. Increasing the angulation makes the ultrasound beam plane move counterclockwise in this view. reflects the depth of the insertion of the TEE probe into the oesophagus. Moving the slider up moves the virtual TEE Probe toward the stomach and moving it down pulls the TEE probe. 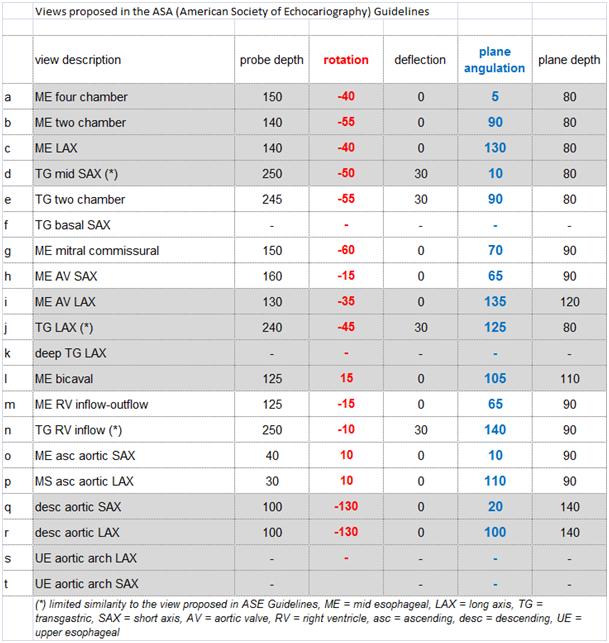 reflects the range of the ultrasound beam. 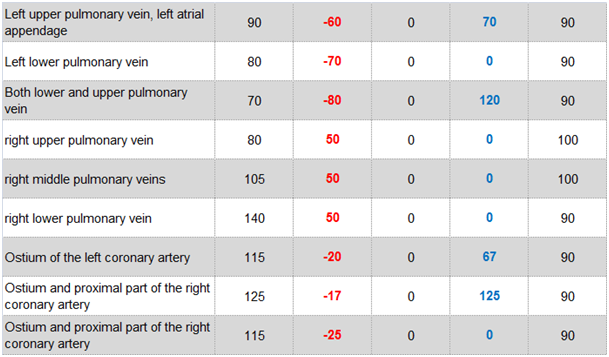 The table below presents the settings (for the "normal cardio set") allowing to visualize similar views as proposed by the American Society of Echocardiography . Suggestions for changes or additional views are welcome. If it doesn't work feel free to contact the administrator: pioro(at)agh.edu.pl. Echocardiography is one of the most important diagnostic tools in cardiology. The two most widespread modes of echocardiography are transthoracic (TTE) and transoesophageal (TEE) echocardiography, both requiring extensive training. In TEE the manual skills seem to be less important, but it is more challenging for the trainee to imagine the orientation of the cutting planes in space. We therefore developed an online TEE simulator, that in our opinion can help to learn TEE. unroofed CS — patient with totally unroofed coronary sinus and persistent left superior caval vein. 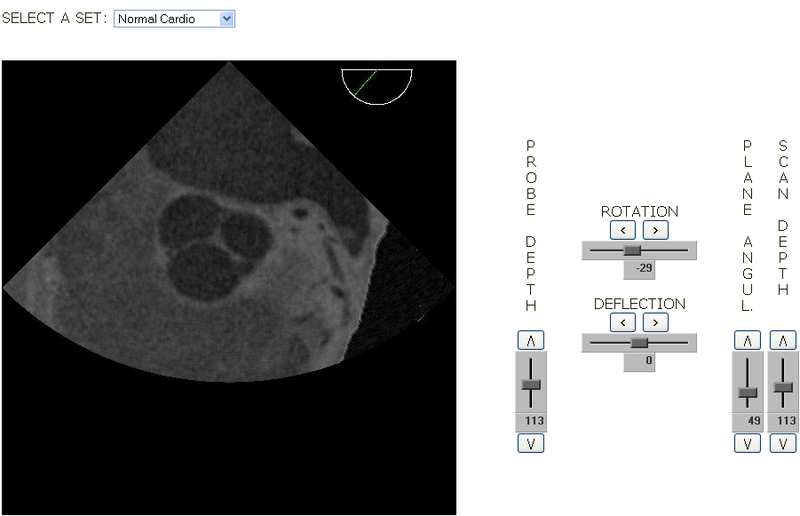 The CT2TEE simulator uses data from Computed Tomography (CT), causing several limitations of this simulator. Further development, including e.g. implementation of motion and adding further data sets is planned . In the download version of the simulator the view changes smoothly while moving the sliders. If you like the online version and would like to download the standalone version - contact the authors. We thank dr Robert Pawel Banys for his help in CT sets retrieving. J.S. Shanewise, et al., ASE/SCA guidelines for performing a comprehensive intraoperative multiplane transesophageal echocardiography examination: recommendations of the American Society of Echocardiography Council for Intraoperative Echocardiography and the Society of Cardiovascular Anesthesiologists Task Force for Certification in Perioperative Transesophageal Echocardiography, J Am Soc Echocardiogr, 12 (1999) 884-900. If you would like to cite us, please use [2-3].